I’m always looking for inspiration on how to better display my succulents. Here are some of the more intriguing container ideas I’ve come across on the web, ranging from the fairly mainstream to the mildly unusual and the outright wacky. Yucca rostrata, one of my favorite succulents, in a contemporary V-shaped container. ¡Me gusta mucho! Anybody know a local source for the container in Northern California? I have three small Yucca rostrata that need a stylish home. Handmade in the Bay Area from at least 50% recycled steel, enameled in various colors. I find this über cool. Other designs on their web site. I’m a sucker for steel containers. If I had a local source for something like that, I’d buy one! Old filing cabinet. Actually makes a clean looking modern container and is much cheaper than a purpose-built metal planter. Not sure about the color though. Cinder blocks. Now this I dig! Recycled ash flooring. Clean, minimalistic and just plain beautiful. I just wish it were bigger. I don’t know what the actual container is but I love the simplicity—that is, after you throw out the silly rock. Tea tins. Too bad I threw out my tea tin collection years ago. Oddly attractive although borderline little-old-lady-with-blue-hair. Various old containers, or “antiques” as they are called here in the U.S. I actually like these, especially the metal toolbox on the left and the wooden box on top. A bit on the Kountry Kitchen side but at least there are no stenciled geese. Crap or junk art? Kitsch or inspired design? If I were the cactus, I’d feel a tad undignified. Old camera. I have a few of those lying around. What would happen if you hung the camera from its strap? Another cactus-in-a-camera design. I used to see lots of old Brownie cameras in yard sales but the supply has dried up in recent years. Maybe they’ve all been snatched up by Etsy sellers. OK, I’ll admit it. I’ve always wanted one of these face pots, tacky or not. Old boot. Perfect for your Gold Rush garden. New shoe. Perfect for the Real Housewives of XYZ. Golly Pods. Perfect for your Avatar-themed conservatory. That’s what I should have done with that broken old papasan chair! Silly me, I threw it away! Old car part. Don’t ask me which part that is. I barely know how to open the hood of a car. Hey, if you have to have an old car sitting in your front yard, you might as well make it pretty! For the die-hard hoarders who won’t throw anything out, not even a bicycle that looks like it’s encrusted with pigeon poop. Old trunk turned succulent-studded pirate’s chest. Making these is the perfect pastime for aging buccaneers who can’t buckle the swash no more. Duh—I should have seen this coming! Million dollar question: Is the toilet new or used? OK, I simply have to post this. 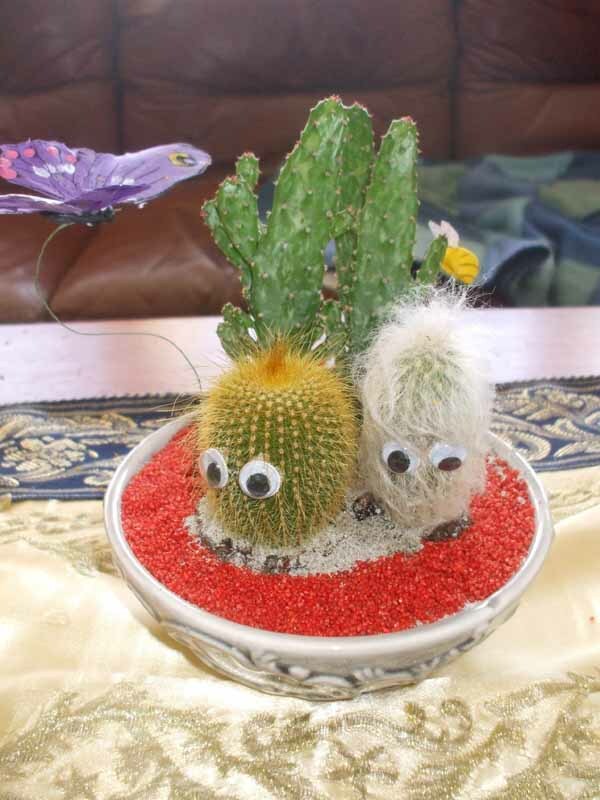 Not because the container is anything special, but because I think there should be a law against sticking googly eyes on cacti. This is a great post! So many different ideas (not all good). I was actually going to suggest cinder blocks to you when you were talking about a new succulent display in another post. Also, don't remove the "silly" imagine rock from that one planter -- just flip it over! A lot of these wouldn't work in wetter or colder climates either, but still great ideas to get me thinking about alternate containers. Thanks for collecting them in one place! My favourite is the first one with the Yucca rostrata and the Cinder Block planters, how cool is that!! We have several of the pot in the first photo, which we got from the garden section of IKEA furniture store. There is an off chance they sell them in your nearest IKEA branch so worth checking out. I wish I could access your blog at work. For some reason it doesn't want to open up there but is fine at home. I was looking for inspiration on the Internet, and this is what I found. 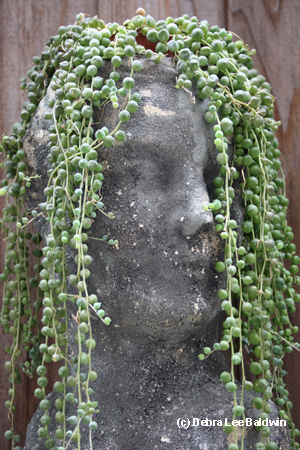 People do a lot of creative--and wacky--things with succulents! 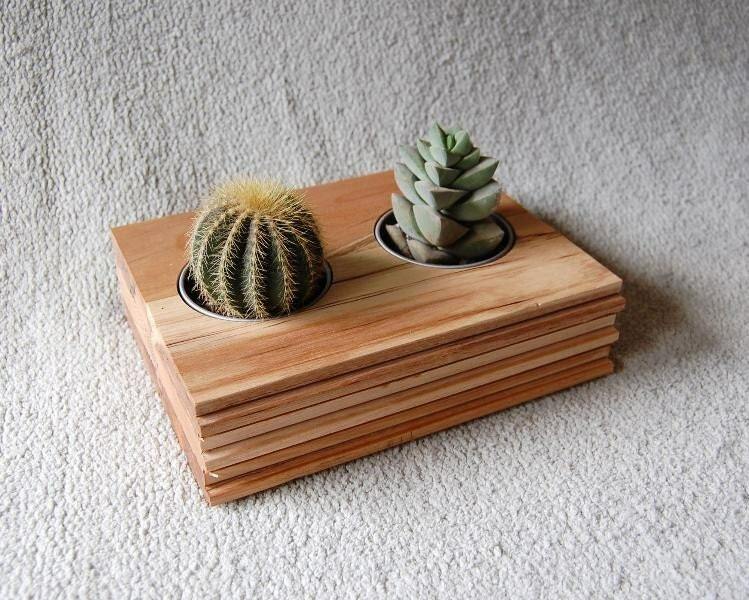 Alan, you could make a movable succulent garden in a shallow container and put it in your garage for the winter. Mark and Gaz, funny that you should mention IKEA. I'm going to have a post about succulents from IKEA tomorrow. Their container selection used to be much better. This year it's mostly indoor containers. I do like their designs, I just wish they had more gardening stuff for outdoors. Even so, I'm happy to have an IKEA store just 15 minutes from here. Mark, about you not being able to access my blog from work: what's up with that??? I wonder if it is because I have a custom domain now (bambooandmore.info). My blog is powered by Google, just like yours. Can you access your own blog from work? Hi Gerhard, I'm not sure why I can't access your blog anymore from work. It was fine before until last week, coinciding when you had your custom domain, it tries to load then I get an error message then it terminates the action. I can access my own blog fine though. Don't rush changing any of your settings though, I suspect there's something wrong with our work access as your blog loads fine at home. Our work system isn't updated regularly, but once they do I'm hoping it will sort out the problem. Looking forward to your IKEA post, we've had some surprise garden finds from there through the years! In spring and summer they bring in a nice selection of garden pots and accesories, and some superb plants too. Thanks to sacconnect I found you blog!! I'm just up the hill in El Dorado Hills so howdy neighbor! I absolutely love some of these ideas - especially the old bike, old boot, antique containers and the tonka truck. Really like the box with the inspirational rock in it! I can do without the toilet and old car! I am really looking foward to the weather clearing up so I can get outside and put some of these ideas into action. Shannon, welcome distant neighbor! I'm very happy you found my blog. I try to post something new every day so please check back often and let me know what you think. Like you, I'm tired of the winter weather that refuses to leave. I want to clean up the yard and get cracking on some projects!!! Great post Gerhard! I got some great ideas! Also I agree on no more gluing of eyes and fake flowers! It messes up the plant! Well I love the post, it had me laughing and giggling at your caustic remarks about some of the containers. You need a new updated one and have your viewers send some of their container pictures in, I only suggest that because I have an unusal one myself ;) Although, not too sure I want to see your commentary about what I'm using, HA! Sandee, I've also been thinking of doing an update. It was a fun post to put together. And my comments are all in good humor, I certainly don't mean to offend anybody. I know very well that we all like different things, and taste should never be judged. Having said that, what *is* your unusual container? The papasan succulent chair photo is my show case display garden. The URL source Bakati stole my image. Please change or remove image ASAP! Roxanne, I'm really sorry to hear that. I've changed the image attribution to reflect that you are the copyright holder. I hope that is satisfactory.